@mikegerwitz Right, this will definitely strike a nerve with the public because it&apos;s real people listening. Traditionally, keyword analysis of speech is expensive (money and storage, processing power) but this cost can be driven down by cheap labor and AI/ML techniques. But this is the #1 audience comment and reason that journalists contact me - that they suspect conversations are being recorded and analyzed for their content. @mikegerwitz ...with the person who suspects their conversations are being analyzed for their content. Humans underestimate the power of metadata, social graphs, "traditional" analytics, and behavioral profiling. Why analyze the content of messages/speech when it&apos;s a PR nightmare and potential legal liability? 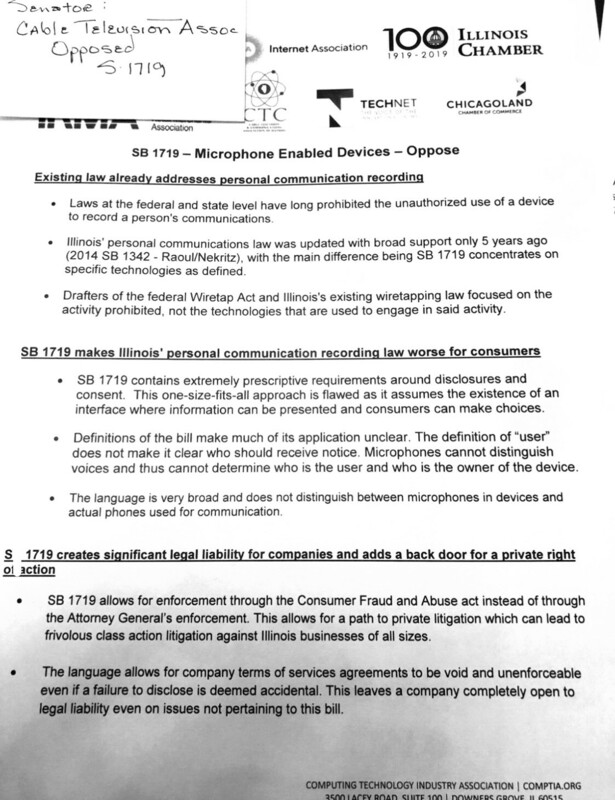 @mikegerwitz ...called "Keep Internet Devices Safe Act" (SB1719). Amazon and Google are opposing it with the attached talking points (via https://twitter.com/matthewstoller/status/1115991653662195713). I know of two other cases like this Alexa example that made press. Samsung SmartTV in 2015 w/ help from Nuance Comms (now a partner for Apple&apos;s Siri), and "My Friend Cayla" dolls in 2017 (again w/ Nuance).